1. Clear span outdoor tent: There is no central pole, which means uninterrupted space within the outdoor tent and no guy-ropes to trip over outside. 2. Installation on any surface: Including hard surfaces like sand, gravel, and concrete. This is because outdoor tent can be secured to the ground with weights instead of pegs. Although we would recommend using pegs where possible and are advisable in severe winds. 3. Installation almost anywhere: No guy-ropes means outdoor tent can fit in small town gardens, on roof terraces, in courtyards etc. as they can make the maximum use of space. 4. Winter stability: Clear span marquee withstand higher wind speeds and snow loadings so Shelter outdoor tent is a practical option in winter. 5. Safety: The outer cover are made from flame-retardant PVC ,UV stabilized, long terms usage. 6. Flexible use of space: Frames can be joined together to cover large areas, fit L-shaped gardens or allow for different areas within an event. 1. KOP new party tent is the widely use party tent. It widely used in weddings, garden parties, balls, bridal showers, outdoor trade show, exhibition, baby showers, funerals, graduations, birthdays etc. 2. New Party Tent applies bar-tensioning system instead of rubber-tensioning system for roof cover. 3. Sidewalls are fixed on eave beam directly instead of hang on the round bar with rings, so the New Party Tent wind speed and air-proof are highly improved. 4. 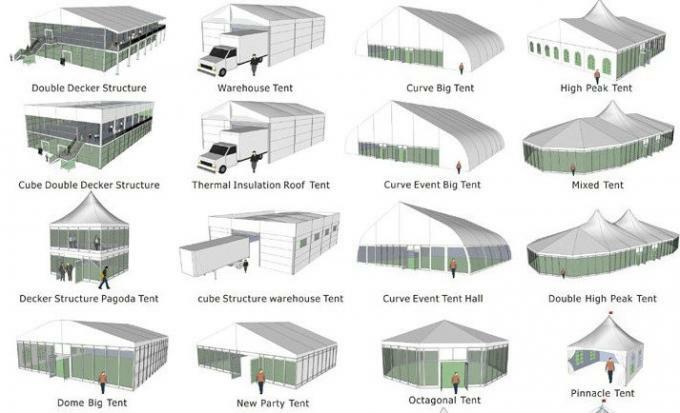 The normal span for New Party Tent range are 6m, 8m, 9m, 10m, 12m, side height: 2.6m; bay distance: 3.0m. 5. Upright supports and roof beams are all made out of 100x48x3mm four channels reinforced aluminum. 6. It is interchangeable with floor, glass wall, ABS wall, glass door etc, it meets all functions requirements. The length could be customized, 10M, 15M, 20M, +5Mmore………..
No bearing column in the middle of the structure, you can use the space fully. With the merits of fast to set up and dismantle, Small volume after taken down which convenient to stock and transport which is know as the real mobile estate.